An 11-year-old boy presented with scars on both cheeks. He gave a history of waxing and waning pruritic papules and papulovesicles on the face as well as on the dorsa of the hands since 3-4 years. There was no history of photosensitivity, other systemic complaints or family history of a similar condition. 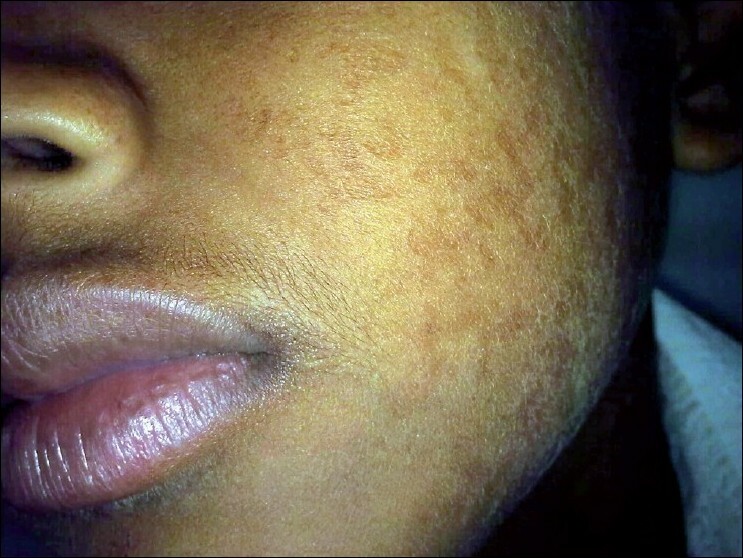 On examination, pock-like and vermiculate scars were present on both cheeks, extending from the nasolabial folds to the pre-auricular region [Figure 1]. There were no comedones or milia. 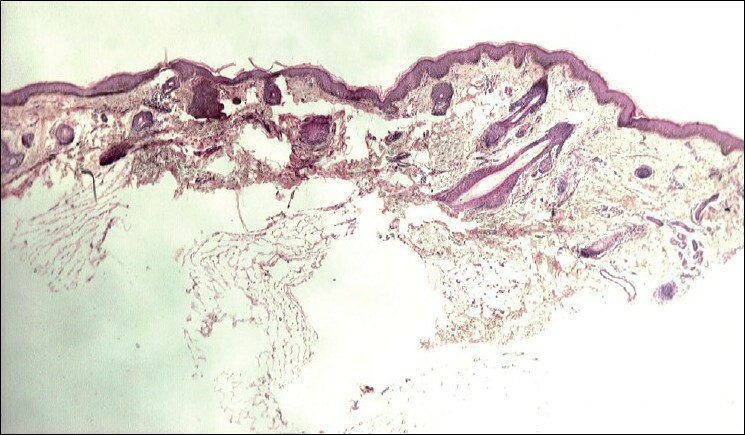 A punch biopsy from the facial lesion revealed follicular plugging and dermal atrophy [Figure 2]. Some of the hair follicles were atrophic and accompanied by small, poorly developed sebaceous units [Figure 3]. 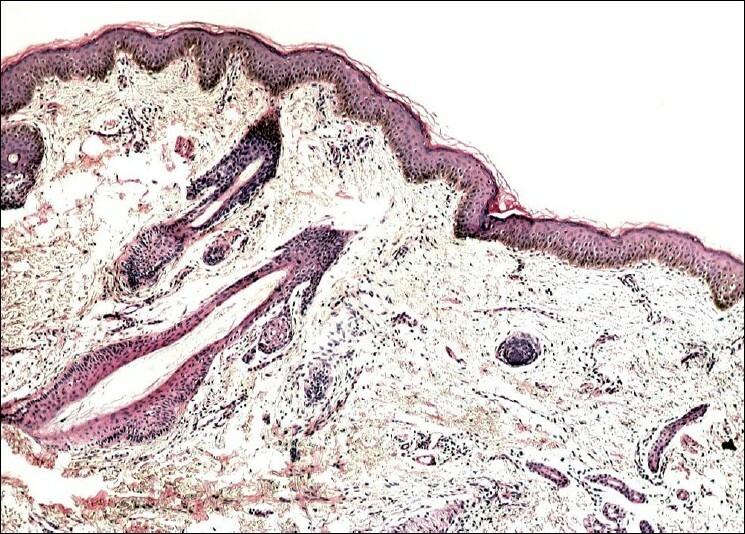 The dermis showed a mild perivascular lymphocytic infiltrate. There were no vascular changes or dermal deposits. AV is a rare, disfiguring dermatologic condition characterized by reticular atrophy of the cheeks. This is a consequence of abnormal keratinisation of the pilosebaceous unit. A typical lesion develops in late childhood, presents as "worm-eaten" or "honey combed" atrophy of the skin and usually affects the pre-auricular region and cheeks on both sides. Rarely, the lesion may be unilateral in distribution. , Erythema, comedones and follicular plugs may be present. Histologic findings are as described in the case. In addition, there may be comedones, milia and variable dermal fibrosis. 1. Arrieta E, Milgram-Sternberg Y. Honeycomb atrophy on the right cheek. Arch Dermatol 1988;124:1101-1104. 2. Weedon D. Diseases of cutaneous appendages. In: Weedon D, editor. Skin Pathology. Edinburgh: Churchill Livingstone; 1997. p. 381-423. 3. Rozum LT, Mehregan AH, Johnson SA, Folliculitis ulerythematosa reticulata: A case with unilateral lesions. Arch Dermatol 1972;106:388-9. 4. van Steensel MA, Jaspers NG, Steijlen PM. A case of Rombo syndrome. Br J Dermatol 2001;144:1215-8. 5. Timonen K, Kariniemi AL, Niemi KM, Teppo AM, Tenhunen R, Kauppinen R. Vascular changes in erythropoietic protoporphyria: Histopathologic and immunohistochemical study. J Am Acad Dermatol 2000;43:489-97. 7. Handrick C, Alster TS. Laser treatment of atrophoderma vermiculata. J Am Acad Dermatol 2001;44:693-5. 8. Clark SM, Mill CM, Lanigan SW. Treatment of keratosis pilaris atrophicans with the pulsed tunable dye laser. J Cutan Laser Ther 2000;2:151-6. 9. Bedi TR, Mohindra M. Folliculitis ulerythematosa reticulata. Indian J Dermatol 1977;22:133-4.